I feel like such a fraud. I am known for my innovation, resourcefulness, and nonconformity. And here we are, joining the suburban sheep herd. 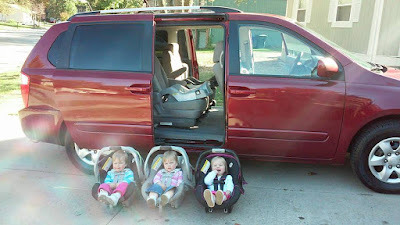 We bought a minivan. My girls and their new ride. We have toddlers who have grown out of their baby seats into convertible ("big girl") car seats, which means they no longer fit 3-across in the back seat of a sedan. Paying $500 per seat for the narrow European models is silly when we could put those funds toward a down payment on a new vehicle. Then, unless one finds a low mileage Ford Crown Victoria (good luck with that), there aren't a whole lot of alternatives. There just isn't enough hip space on the rear bench to secure three car seats. Mind you, we didn't buy new. We found a low mileage late model on a great deal. And we didn't buy the ubiquitous Honda Odyssey either (even though I will admit, those engines are nigh-indestructible). I only cared about having something with a solid engine and trans, functioning climate control, with enough space for the kids and their stuff. I admit, having a van will be nice for the long road trips to visit the grandparents. It will be nice because we can actually fit the big stroller in the rear. It will be nice not to have to make 2 trips home from the warehouse store because we can't fit 2 adults, 3 kids, and the toilet paper in at the same time (true story!). We made it work with a mid-sized sedan for 21 months. We just ran out of real estate (and the sedan developed a coolant leak and a worsening oil leak). It was time to upgrade the family vehicle. So why do I feel like a complete sell-out?